Student of teh Year 2 trailer released featuring Tiger Shroff, Ananya Pandey and Tara Sutaria. Karan Johar's SOTY 2 has fully utilised Tiger Shroff's abs. In fact, the whole trailer is full of Tiger's abs and his flying technique. 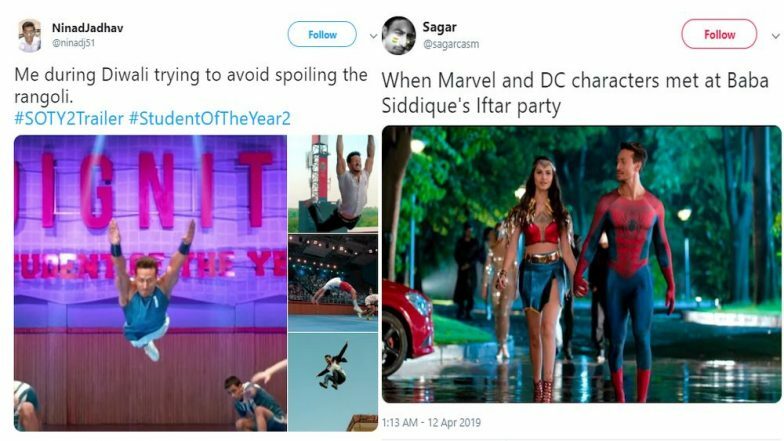 Reviews about the trailer are quite mixed but people in no time have found ways of making hilarious memes out of some scenes from Student of the year 2 movie. Right from the scene where Tiger Shroff is seen in Spiderman's suit and Tara Sutaria in DC's wonder woman suit to all the flying skills shown by the hero in the movie. There's some meme for every frame of Student of year 2 trailer online. Student of the Year 2: Ananya Panday or Tara Sutaria, Who Looks Best With Tiger Shroff? – Vote Now. Like are you even a Marvel or DC fan? Journalist : Do you like Marvel or DC? Struggler actor : Bollywood me kab launch hoga mera? Like really, who did this? LMAO. I really couldn't stop laughing after checking these memes out! Some of them have roasted Karan Johar's SOTY really hard.